Published By – Kobalt Songs Music Publishing, Inc.
Bought one of these today. "WG" in deadwax. Low Volume and clipped vocals abound. Side A sounds worse than B, which leads me to believe there is also an issue with the pressing. It is a shame, as I was looking forward to this album. Such a characteristic and beautiful voice wasted on terrible production/distribution. I should have come here to read reviews before I made the purchase. Recently purchased one new (Dec 2018) with "WG/NRP" in the deadwax. Volume is low and music sounds heavily compressed. Very disappointed in this pressing. 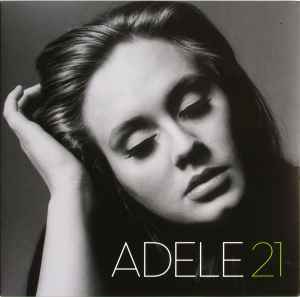 21 by Adele is probably my favorite album of the 21st century all the songs on the record are amazing (and appropriate). I personally prefer this album over her new one 25. The thing that make this album stand out is the likability of the songs. You may have only listened to a few of the songs on this album and enjoyed them but the rest of the songs are amazing as well. Adele herself is also an amazing artist with a very distinct deep voice and here songs are a perfect match with her voice type making the songs even more beautiful. In the end I would highly suggest you get this album if you like soft (and appropriate) love songs. If you like how your copy sounds, please - all of you - look in the deadwax, reply to this comment and lemme know whether it's a WG or an RJ cut. It makes me scared on buying US published vinyl. Scratches and fingerprints are everywhere, making them look like preowned. And there is a deep scratch that makes the Don't You Remember have a periodic electrostatic sound. So I returned it and buy a EU printed instead which is cheaper and had a perfectly new condition when I unboxed it. Sounds great! However, the LP did not come in a standard anti-static record sleeve. It came in a laminate one which has cause some damage. There are also MASSIVE hand prints on both sides of the record. Excellent pressing! ADELE's US XL pressings are solid quality records, the EU pressings are tame and full of pops & distorted.